The 2019 NFL Free Agency period came and went last week in what felt like a blink of an eye. While some teams passed the eye test with their splash additions in free agency, we took to the data to really tell us who won, and who lost, during the first week of free agency by taking a look at each team’s additions and subtractions via each individual player’s Wins Above Replacement (WAR) figure from the last season they played. For the sake of clarity, the wins above replacement figures mentioned below are from the last season a player played and are roughly the number of wins a team receives from their services above those of a street-level free agent acquisition. The higher the positive number, the more wins, the better the figure. The lower the negative number, the more losses, the worse the figure becomes. Dr. Eric Eager and our very own Cris Collinsworth discussed the PFF WAR metrics and how they’re changing the status quo last year, and stay tuned this offseason when we unveil the methods behind the process. The Titans won the first week of free agency by simply shedding themselves of Blaine Gabbert‘s contract and services. As frankly put as it can be, Gabbert has cost his team multiple victories since 2016 and while their addition of QB Ryan Tannehill doesn’t do much from them per PFF Grades (Gabbert was the only quarterback with a lower PFF overall grade than Tannehill last year, min. 100 dropbacks), it’s Tannehill’s safe nature and propensity to do enough to keep his team in the game that serves as the bigger upgrade here. Tannehill hovered around at -0.2-ish WAR in 2018, so his acquisition to back up Marcus Mariota puts Tennessee in a much better position should the team need to turn to the bench once again given Mariota’s injury history. The addition of Adam Humphries and Rodger Saffold additionally help buoy their ranking here as that duo were each worth about a quarter of a win above replacement for Tampa Bay and Los Angeles, respectively, last year. Their big acquisition of Cameron Wake on the defensive side of things is what gave them the ultimate win in the first week of free agency. Wake, although getting up there in years, is still one of the league’s most feared pass-rushers, and for good reason. Worth nearly a third of a win for the Dolphins last year, he dominated the AFC East and will look to do the same thing in the twilight of his career with a team that should have playoff dreams entering 2019. Unlike the Titans, the Chargers land at No. 2 after the first week of free agency by the additions they made. Thomas Davis should help improve their linebacking corps tremendously, as even with Davis’ advanced age he finished the season about a third of a win above replacement last year. Tyrod Taylor adds the equivalent of a movable chess piece on offense and can be deployed in a variety of manners as Philip Rivers isn’t getting any younger. Despite Taylor’s athleticism and background that followed him from Buffalo to Cleveland, he has actually finished the past three seasons combined with the lowest amount of turnover-worthy plays from qualified quarterbacks. He plays a safe level of football that while it may not win you as many games as say Rivers, it also isn’t going to lose your team many games if he had to come in in a pinch. Rivers’ tutelage could do wonders for Taylor’s game, and at worst, he serves as a quality backup for the Chargers. Le’Veon Bell is their prized acquisition this past week as the star running back nearly eclipsed one full win above replacement during his last outing in 2017. Bell is a valuable pass-catcher out of the backfield and will add more than just a check-down, safe go-to weapon for young Sam Darnold, but it was also the other moves that New York pulled off that see them rise to No. 3 here. They retained Henry Anderson and Steve McLendon on the defensive line in smart moves while they also acquired guard Kelechi Osemele from Oakland after even a down year for him with the Raiders saw him post a positive WAR. C.J. Mosely was also handed a big check to join the Jets after seeing nearly a half a win above replacement follow him from Baltimore. Mosley at his best is a talented coverage linebacker who can add a strong pass-rushing skill set. He has accumulated 84 career QB pressures while also accumulating a total of 22 plays on the ball in coverage over his career. The Lions spent big, but they spent big on pieces that should ultimately pay off if they perform. Trey Flowers rejoins his former defensive coordinator in Lions’ Head Coach Matt Patricia, heading over from New England where he was worth over a half a win above replacement. Flowers finished second among edge defenders in total pressures last year, the second consecutive season in which he brought in at least 77 pressures on the quarterback. To put that kind of production into perspective for Detroit fans, no Lions pass-rusher in the PFF era (2006-Present) has accumulated more than 72 pressures in a season, and only twice since 2006 has a pass-rusher recorded more than 70. Not since Ezekiel Ansah recorded 71 in 2014 and Ndamukong Suh recorded 72 in 2013 have the Lions had more than 70 pressures in a season. Justin Coleman also joined the defense to man the slot, ideally, as the slot cornerback continues to grow in importance in today’s NFL. Aside from Tracy Walker and Darius Slay, no defensive back saw coverage grades above 70.0 last season whereas Coleman has back-to-back 75.0-plus coverage grades during his two years in Seattle. His near-third of a win above replacement shows how valuable even one successful cornerback can be, and he joins Detroit at just 25 years old, with plenty of young, solid football ahead of him. Bolstering their defense under new head coach Kliff Kingsbury seemed to be a priority entering free agency as they quickly signed Terrell Suggs and Jordan Hicks while letting failed first-round pick Deone Bucannon finally walk after five years with the team. Bucannon cost the team nearly a quarter of a win last season while Suggs and Hicks each were worth a third of a win or more for their respective teams in 2018. Suggs’ career predates the PFF era, and since the 2006 season, he has been the model of consistency, recording 10 seasons of at least 40 pressures and plus-grades in all but one of his healthy seasons. Hicks’ strongest play comes in coverage, an aspect of growing importance for NFL linebackers in today’s world. He can fly to the ball and has allowed just four touchdowns in four seasons, compared to seven interceptions and seven pass breakups. The Cardinals’ additions on the offensive line didn’t do much for them, from a WAR standpoint, however, their strong effort to get better on the defensive side of the ball still firmly place them in the bottom end of our top five. While getting back a first- and a third-round pick for Odell Beckham Jr. may seem like a strong return, the truth of the matter is this: OBJ was one of the most valuable non-quarterbacks in recent memory and his nearly two full wins above replacement are going to be hard to come by. Combine that with their loss of Landon Collins, who was worth three-quarters of a win, on the defensive side of the ball, and the Giants have done more harm than good to a roster depleted of playmakers outside of Saquon Barkley. Golden Tate will make people miss, and his positive addition to the team’s overall WAR saw them move from the bottom of the barrel after losing Olivier Vernon’s services, also to the Cleveland Browns. The Vikings didn’t do much outside of their peculiar situation of retaining Anthony Barr, and it was ultimately who they lost overall that saw them fall down the list after the first week. Sheldon Richardson heads to Cleveland, Latavius Murray is off to New Orleans, Andrew Sendejo is a free agent, and all Minnesota did was bring in Shamar Stephen from Seattle. Collectively, their losses in free agency nearly equaled a full win above replacement, and their draft strategy should reflect what they lost come April. Like the Vikings, the Bucs didn’t do much this free agency period as they didn’t have the cap space. They spent on former Cardinals LB Deone Bucannon and Shaquil Barrett, only the latter of which brought with him a positive WAR figure, however. Losing both Adam Humphries to Tennessee and DeSean Jackson to Philadelphia cost them a full win above replacement, and they’ll have to find a receiver option or two in the draft to cope for such losses. Frank Gore, Ja’Wuan James, Josh Sitton and Danny Amendola each saw a positive win above replacement number a season ago, and will each be suiting up for new teams come fall. Gore likely hits the hardest as even despite his age, he still represented the second highest-graded Dolphin offensive player a season ago and the highest-graded AFC East running back from 2018. While Cameron Wake‘s presence being gone will be the end of an era and also hurt from a WAR perspective, their additions in free agency also raised some eyebrows. They gave a decent amount of money to Dwayne Allen fresh off a three-catch season with New England, a year that actually cost the Patriots almost a quarter of a win while they also brought in Clive Walford at the same position after he also cost his former team a quarter of a win since 2016. 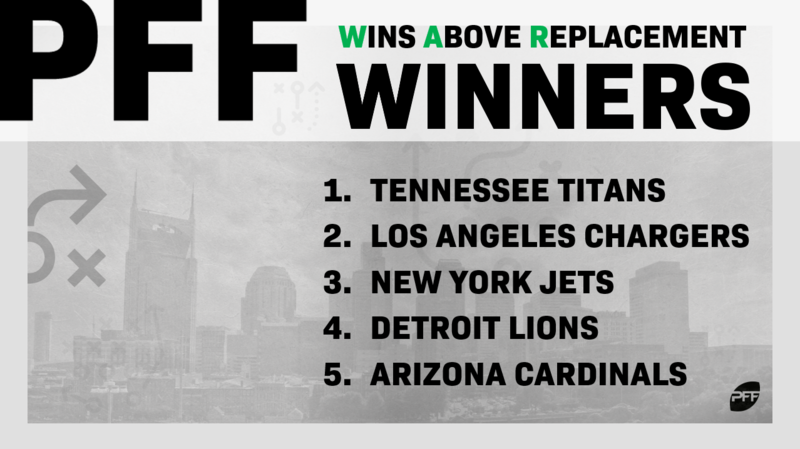 The only thing keeping them from potentially taking the bottom spot from our next team is their swap from Ryan Tannehill (nearly cost a quarter of a win) to Ryan Fitzpatrick (worth a sixth of a win) at the quarterback position. 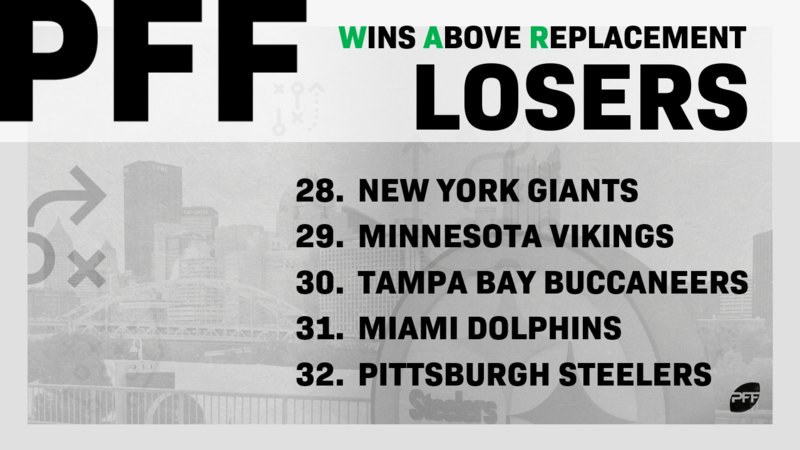 It’s hard to lose almost three wins above replacement from two offensive players and attempt to replace those guys with practically anyone, but that’s basically what the Steelers have had to try to do this past week. Le’Veon Bell was worth almost a full win while Antonio Brown was worth closer to two full wins and they’ll both be playing for different AFC teams next fall. Pittsburgh did little else to catapult themselves from the bottom here, and only the signing of Steven Nelson helped put them in the green in terms of positive WAR. Still, it may be a tough road ahead of Steeler Nation this offseason.